Our decorations are, wherever possible, made from natural materials ,wood, cardboard, felt, wool and of course, eggs! A cute little Easter hen who keeps her colorful eggs nice and warm, as well as her feet, thanks to these big, stripey and very stylish socks! 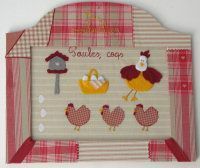 A fabric and felt picture with a hens and eggs theme, placed in a matching patchwork fabric picture frame. It's really easy: just fill a balloon with quick-setting plaster of paris, then hang it up. Once it's dry, remove the ballon and you have an egg shape. A little sandpapering may be needed to make the pointed part of the egg less pronounced. How about if we decorated real eggs as well? The natural, traditional egg-decorating method is to dye the eggs after they have been boiled, so you can then enjoy a colorful (and very edible) egg during your Easter meal! Boiling the egg in a mix of water and beetroot juice will add vibrant color to your Easter eggs. Also worth trying: curry powder (for yellow eggs), a few drops of soy sauce (gives a brown color)... For an even more original approach, there are marbled eggs : all you have to do is wrap the eggs in wide strips of red onion skin before cooking (tying it fast with food-grade string). Then, boil the eggs: when they come out of the water, the eggs have taken on red-brown marbled look. You may also simply tie string around the eggs before boiling them to obtain an original striped effect. An Easter chick basket craft design created by Moryan décoration : hidden behind the chick is a basket waiting to be filled with chocolate eggs when the big day comes, and with pens the rest of the year!